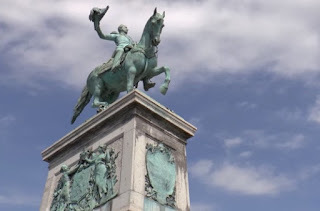 Luxembourg's National Day is originally the birthday celebration of the country, the Grand Duchy, which began on the birth of the Grand Duchess Charlotte, on 23 January. Because they didn't want to celebrate the national day in winter, they postponed the national celebrations to June 23. This date remained unchanged even after her regime ended. The celebrations all over the Grand Dukes begin on the evening of the National Day, on 22 June. In the capital, Luxembourg City, the festivities begin with festive ceremonies for the exchange of guards at the Grand-Ducal Palace around 4:00 pm. In the evening there are torchlight parades in the capital. The public areas and narrow streets of Luxembourg turn into a huge open-air party with free concerts, DJs and dancing around the city. Local food stalls such as hot dogs, potato fritter, Luxembourgian beer and wine are also opened and offer plenty of options. Later at night there is a fireworks show from Adolphe Bridge. The next day, on National Day (June 23), the day begins with an official ceremony, followed by a military parade that begins at the train station. In the afternoon there is a teh daum (a psalm of thanksgiving and early Christian prayer) in Notre Dame Cathedral. Luxembourg is the smallest country in Europe in terms of population - it has about half a million people. Luxembourg is one of the smallest countries in the world in terms of size - its territory is only 2,586 square kilometers. 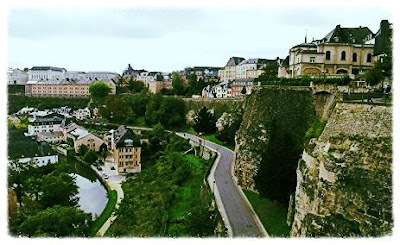 Although Luxembourg is such a small country, it is one of the richest countries in the world. Its per capita GDP is the highest in the world and its unemployment rate is the lowest in the European Union. Luxembourg gained independence from the French Empire on 9 June 1815. Luxembourgish, French and German. The official language in Luxembourg is Luxembourgish. Every year, about one million tourists visit Luxembourg (more than the citizens who live there). According to TripAdvisor website, the attraction that attracts the most tourists in Luxembourg is its American cemetery. This is a military cemetery that was first established during World War II and was chosen as one of the 12 permanent American cemeteries in Europe during this war. Many cavities buried in temporary burial sites were transferred to it. 40% of Luxembourg's population is immigrants who came mainly from Portugal. The smallest wage gap between men and women is found in the state of Luxembourg and stands at only 4.9%! The capital city of Luxembourg is named as the name of the country, Luxembourg. The national motto of Luxembourg is "we strive to remain who we are" - "Mir wëlle bleiwe wat mir sinn" (Luxembourgish). Luxembourg won the Eurovision title five times. In 1961, 1965, 1972, 1973, and 1983. Not a bad achievement for a country so small.